This tool allows Explorer++ to display files in different colors, according to rules which modify the display of files by filename and/or attributes. 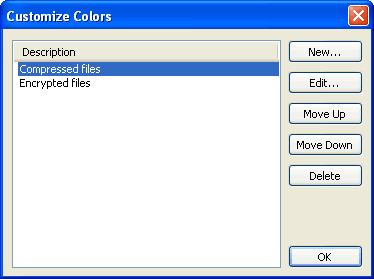 Like the Filter routine, coloring certain files or folders aids in quickly finding what you want. This list shows all color rules, by their description (ie. name). Their application to files in the Files pane` is by their order of appearance in this list; the first rule (top) is applied first, the bottom of the list is applied last. Individual rules (ie. one at a time) may be selected for re-ordering, editing or deletion. This opens the New Color Rule dialog for creation of a new rule. The dialog is virtually identical in form and function to the Edit Color Rule dialog, buts adds to the rule list rather than editing an existing rule. This function edits the currently selected rule. Enter a description in this field; this is the name that will identify the rule in the Rules list. 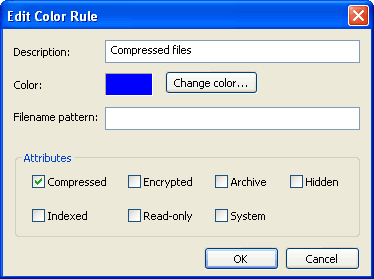 The color assigned to files which match this rule is shown in a small swatch. which would match any GIF image files. If attributes are also checked, then both the filename pattern AND the attributes must match in order for the rule to succeed and the file be colored. Encrypted - file is encrypted using native Windows encryption. Note that checking any attribute box in this dialog does not affect the attributes for any file, it merely reads the attributes as part of this rule. The Move Up and Move Down buttons move a selected rule up or down in the list. Priority of application of rules to the Files pane is determined by their order in the list. Clicking the Delete button deletes a rule (currently selected) from the list; a confirmation dialog is issued prior to deletion. There is no way to recover a deleted rule.